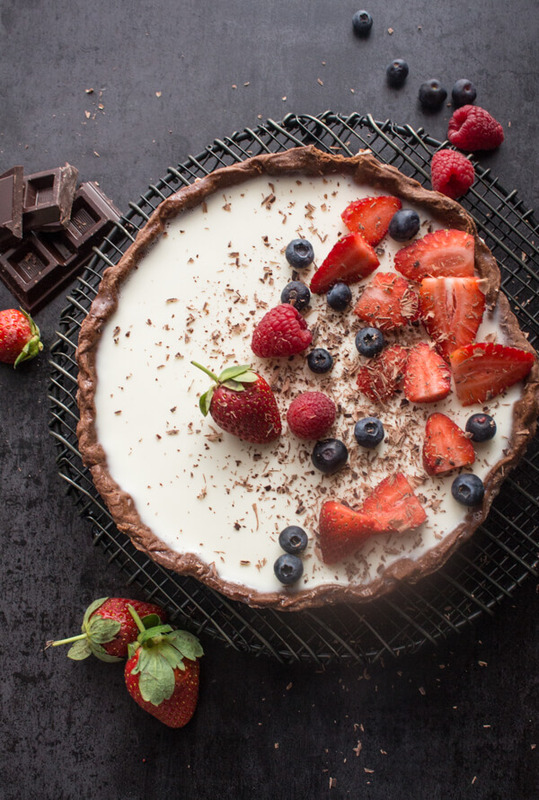 A delicious Panna Cotta Tart with a Chocolate Dough Crust and a Vanilla filling, topped with fresh Berries. An Easy Italian Dessert. So here I am living in Italy for over 20 years and I have never tasted never mind made Panna Cotta! Absurd right? Especially when something this easy is so darn delicious. I even asked the Italian if he had ever tried it and surprise surprise once or twice was his response. Panna Cotta became my new obsession, it was everywhere and I had never tasted it. What could be easier then heating together whole cream, sugar and vanilla then adding some gelatin? Fast Easy and amazingly creamy, rich and you-have-got-to-try-this. 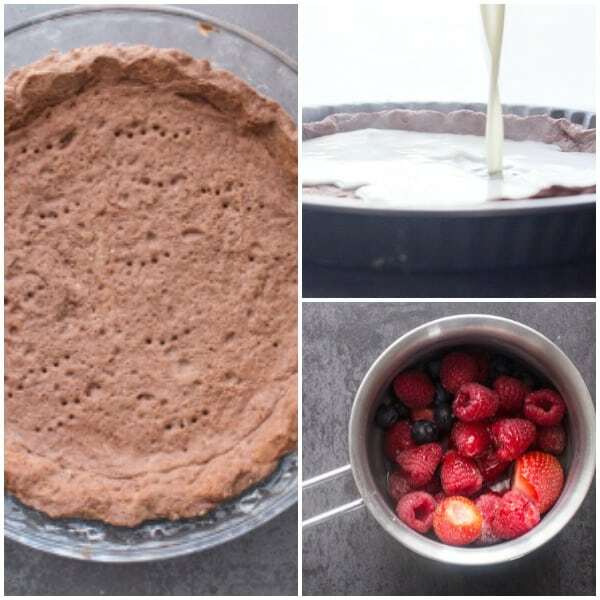 At first I thought I would do the usual Vanilla Panna Cotta in either a glass or in a mold and then I thought if I can fill a Crostata with Italian Pastry Cream why not make the perfect Chocolate Pie Dough and fill it with this exquisite filling. 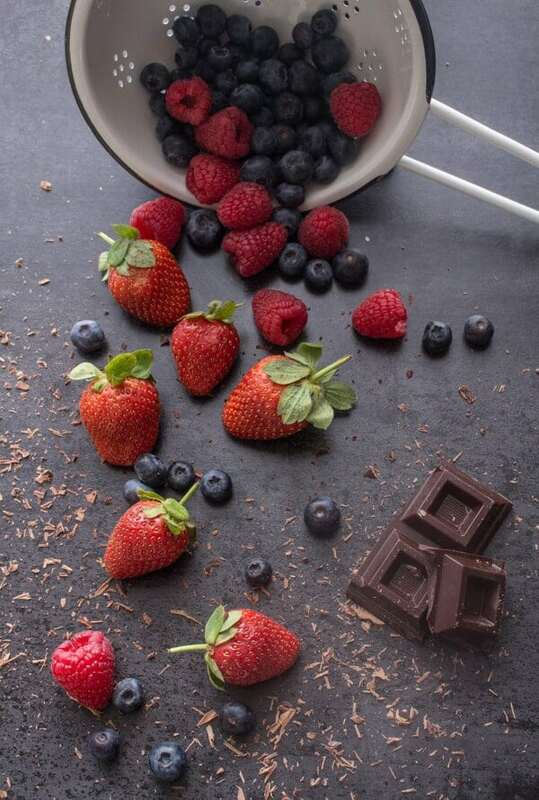 Not only that, I was going to make a sauce with Berries as the perfect topping and of course some grated chocolate doesn’t hurt either! 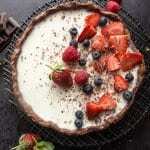 I made my pie dough, baked it and while it was cooling I made the Vanilla Panna Cotta. Don’t worry about it being watery it will firm up in the refrigerator. 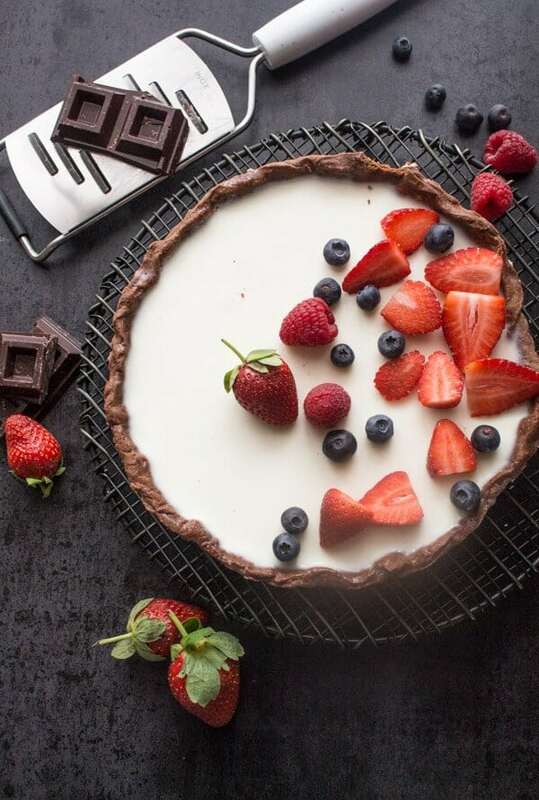 Your Chocolate Vanilla Berry Panna Cotta Tart will have to stay in the fridge for at least 4-5 hours. I left mine overnight. If you are making the Berry Sauce you could make that ahead of time and refrigerate until serving your Panna Cotta Dessert. I would love to know what you think of this if you were asking yourself “What took me so long to try this”? Enjoy! 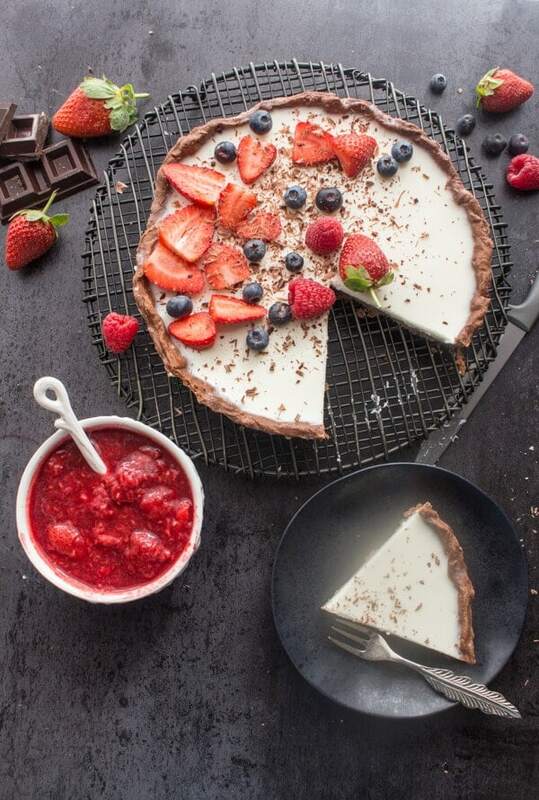 A fast and easy Chocolate Vanilla Berry Panna Cotta Tart. 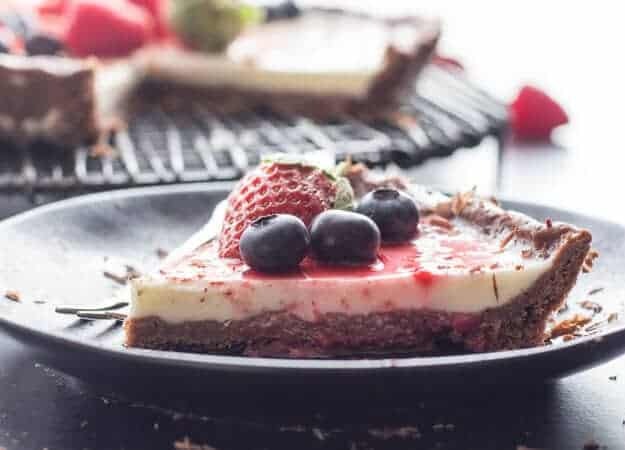 A delicious creamy, delicate Italian Dessert, a berry sauce makes it perfect. In a medium bowl cream together butter, sugar and vanilla then add egg, combine. In a medium bowl whisk together flour, salt, baking powder and cocoa. 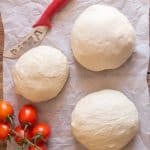 Add to dry mixture to cream mixture and mix with a wooden spoon until almost combined, move to a lightly floured flat surface and knead gently just until you have a soft dough. Wrap in plastic and refrigerate for 30 minutes. Pre-heat oven to 350°F (180°C) . Lightly grease and flour an 8 inch pie plate. 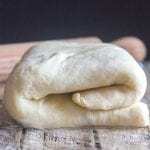 Remove dough from fridge and on a lightly floured flat surface roll dough to 1/8" thickness and fit in pan. 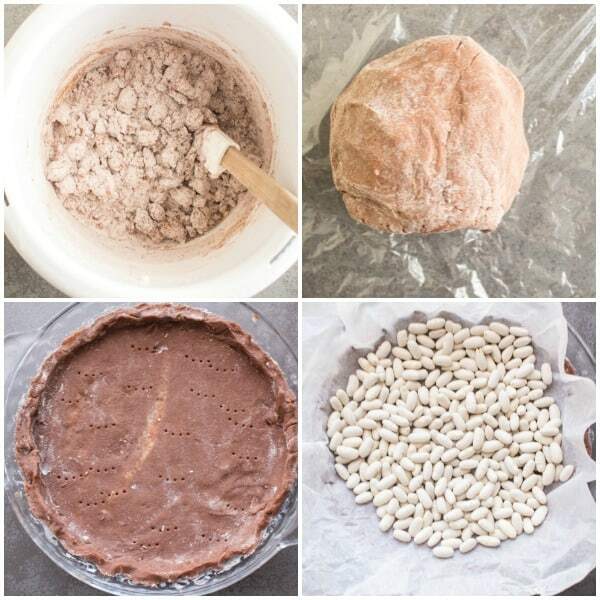 Prick the bottom of the dough with a fork, then cover the dough with parchment paper and weigh it down with dry beans or pie weights. Bake for approximately 20 minutes, remove paper and bake another 3-5 minutes. Let cool completely. In a small bowl add cold water and soak the gelatin leaves for 10 minutes. Remove from water and squeeze out well excess moisture OR In a very small saucepan add 2 tablespoons water and sprinkle in gelatin let stand about 1 minute to soften. Heat gelatin mixture over low heat until gelatin is dissolved and remove pan from heat. 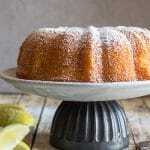 In a medium pot add cream, vanilla and sugar, heat on medium until very hot, but do not boil. Remove from heat and add the gelatin stir until dissolved. Let sit approximately 5-7 minutes, stir and let cool. Add Panna Cotta Mixture to cooled pie crust (mixture will be very runny), refrigerate until firm approximately 4-5 hours or overnight. Top with fresh berries or Berry Sauce. Enjoy! **You are going to have some pie dough left over so check back on Monday for the perfect dessert with left over dough. In a small pot add berries, water and honey, heat on medium until boiling, squish berries gently with a fork, turn heat down and simmer for approximately 5-7 minutes. Let cool and thicken. If I make this a day in advance will the crust be ok? Will it keep in the fridge for a day? Hi Briana, I made mine the night before and it was fine the day after. Hope that helps. Hi Milly to tell the truth the one I buy in Italy is clear (chiaro) sheets, although I do use a powdered one from Canada called Knox gelatine. I hope that helps. Let me know. I made this for a dinner party last night as part of an Italian them because we are spending 3 weeks in Italy next month. Our guests could not stop praising it. And my boyfriend said it is the best dessert I’ve ever made! Thank you! Hi Diane, thanks so much so glad everyone liked it. It’s one of my favourites that is sooo underrated :). Glad you appreciate it. Have a great Sunday. And have a great time in Italy. I tried it! Delicious, beautiful and easy. Everything I want in a dessert. I don’t usually make a crust but this was easy. Next time I’ll keep rolling, mine was a little thick. So very yummy! Thanks for sharing. 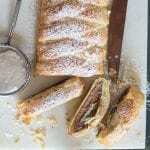 Hi Lisa, thanks so much, so glad you enjoyed it, and I am glad the crust worked out well also. Have a wonderful Sunday. This is pretty! I love desserts like this, so simple and beautiful too. Hi Karen, thanks so much. Have a great week. This looks excellent. Do I need to cover it with plastic wrap when it goes in the refrigerator to cool? Thanks! You have made the masterpiece of such a simple ingredients ! Thank you so much ! I made this for Valentine’s Day and it was amazing. Great recipe. Hi Ann, thanks so much and so glad you enjoyed it.